New Year's has a way of getting us all excited to make some serious life and health changes, while simultaneously making you run to pour a glass of wine when you realize the only thing that raised your heart rate during the past year were the Bravo Real Housewives reunions. New Year’s resolutions can leave us all a bit intimidated, maybe stressed, and caving into our old habits. In their latest campaign to kick off the New Year, Bai is aiming to remove the stress from New Year's resolutions and infuse a little fun into the “New Year, New You” journey. Bai’s “Good into Greatness” photo contest is highlighting their consumers new healthy habits, ranging from taking up walking to incorporating a few more vegetables into their daily diet. To encourage their consumers to share their new healthy habits, they are offering cash prizes towards Bai products and the chance to win a year of better groceries. It is clear from the photos and content uploaded to Bai’s “Good into Greatness” FlexGrid Gallery that their consumers are up for the challenge and are happy to show off how they are living their best lives in 2018. Check out their photo gallery here and upload your own! The response to Bai’s campaign has already been overwhelming positive. To date their campaign has a DCI score of 173 - a score that will definitely have them celebrating any 2018 marketing goals they made for themselves! 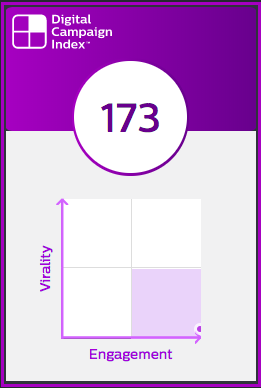 Bai’s DCI score is a combination of an out of this world Engagement Score (ES) of 332 and Virality Score (VS) of <25. The Bai “Good into Greatness” campaign has successfully tapped into the New Year health and fitness crowd and inspired their audience to participate and share how they are pursuing their health goals in 2018. Check out more details below on best practices you can incorporate into your digital campaigns to increase Engagement and Virality this year. Connect to your consumers aspirations. We have mentioned this a few times now, but we can’t say it enough, campaigns that aim to connect with their consumers personally, whether through their interests, goals, or likes/dislikes tend to see the best engagement. Bai as a brand has a deep and impressive understanding of their audience and they regularly launch and create campaigns that capture their audience’s attention and then keep them engaged with Bai and their suite of healthy products. Embed a photo gallery on your website. The Bai team increased the likelihood that consumers would stay on their page by incorporating a scrolling FlexGrid Photo Gallery of their consumers’ photo submissions, increasing time on site and clicks on the latest submissions. Featuring UGC on your homepage helps to drive traffic, increase conversions and showcase authentic usage of your product/service. Create a sense of community around your brand. Bai gave their consumers the platform to share their goals and also be inspired by the actions of other Bai consumers, creating a mini-online community of Bai and health-focused fans, encouraging each other. Creating a positive space for your consumers to interact with other consumers around your product or a common goal will have your engagement rates climbing. Curate a conversation around a popular topic. Consumers are more likely to share content that they feel passionate about and it just so happens health and fitness is one of the most popular topics shared by consumers online and offline. Bai capitalized on a conversation that is already popular, but artfully curated the conversation around what was relevant to their brand. Enable multiple options for sharing. If there is one best practice that every brand or agency can incorporate into their campaigns, it is enabling consumers with the ability to share entries in multiple ways, including Pinterest, Twitter, Facebook and via email. The easier you make the process for sharing the more likely it is that your consumers will share content from your campaign. To learn more about Bai’s “Good into Greatness” photo contest and their various prizes, visit the campaign here. As budgets and marketing plans get finalized, now is the perfect time to take a second to reflect back on your own brand or agencies successes from the previous year and what you hope to accomplish in 2018. Download our Look Book of the best campaigns of 2017 to jumpstart your own campaign planning or firm up plans that are already in place.